This luscious, deeply red Petit Verdot is an amazing example of the fruit-forward, complex and engaging aroma that this varietal is known for. This intense aromatic experience is paired with a profound, richly approachable fruitiness in the mouth. Petite Verdot is an unusual varietal, ready to enter the ranks of exceptional red wines. This varietal originates in the Bordeaux region of France, where it has been used to in blends to intensify color and broaden tannic structure. Notably, it is a very late ripener in the vineyard. Hanging on the vine until the very end of the season intensifies the unique varietal chemistry of this grape. Fermented separately, and guided along the path unsparingly during this kindergarten phase, the new wine is individually pressed to just the right pressure to yield freshness without harshness. The wine is transferred straight into a selection of new and used barrels to harmonize the varietal attributes and add a bit of barrel ageing to balance the flavors. We hope you enjoy this unique varietal as much as we do and, upon tasting, understand why this varietal is so important to many of our wines! 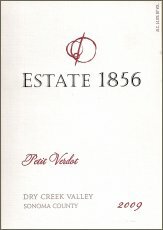 This 2009 Petit Verdot was barrel aged for 22 months in 100% French oak and is composed of 94% Petit Verdot and 6% Cabernet. FOOD PAIRING NOTES: This lush, velvety Petit Verdot would best complement a main course of flavorful red meat flavored with a fruit based sauce. We suggest Lamb Chops with Dried Cherries and Port.